By Carla Piluso of Gresham, Oregon. Carla is a candidate for the Multnomah County Commission. Who would have thought a career police officer would want to venture into the world of politics? 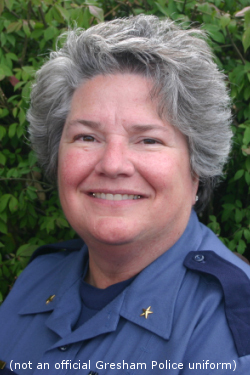 Well, I can tell you that for this 29+ year (the last 6 years as police chief) veteran of the Gresham Police Department, running for Multnomah County Commissioner is a whole new experience. It didn't take much time out on patrol to recognize that strict enforcement was not the best way to change behavior or broadly address crime issues. (This statement does not mean I am soft on crime.) Rather working as neighbors, as part of a community in supporting those in need is crime prevention at its finest. Identifying community recourses and partners, (businesses, human service organizations, law enforcement), as part of the base of support is vital to the success of each individual, family and our communities. I have worked hard to balance my public safety career with involvement with social service organizations. I have served on the Board of Directors for Human Solutions since 1996 and have been the Board Chair since 2000. I also serve on the Board of the Salvation Army and the Police Activities League. I am a member of the Children's justice Alliance, Stand for Children, People for Parks and the Chamber of Commerce. In 2003, I was asked to chair Multnomah County's Commission on Children, Families and Community. We are a citizen based advisory group to the Board of County Commissioners, charged with the oversight of the Human Services aspect of the county. This balance has made me a better police chief, community leader, mom and candidate for Multnomah County Commissioner. I am not one to just talk about what should be done. I make things happen. I am a collaborative leader and a team player. Collectively a course is vetted, planned, designed budgeted and implemented. And when completed, the success is shared. Throughout my entire career (and life) I have been dedicated to transparency and accountability. I have been assessable and approachable. These are the standards I will take with me to the Board of County Commissioners. Thanks for the post, Carla. I think that having someone with a law enforcement background on the county commission is a good idea since a huge chunk of the county's budget goes to law enforcement. Yes, we have a sheriff who oversees much of it, but what happens when you have a sheriff who isn't doing his job and a county commission that has no background in the area? I think we all just experienced that over the past few years. On a similar topic, I am absolutely disgusted by the recent mailer we received from the McKeel campaign. It compared Carla to John McCain and said that she had been endorsed by the "ULTRA CONSERVATIVE" (yes, the mailer had all caps) Multnomah County Republican Party. It overlooked the fact that she has also been endorsed by the Multnomah County Democratic Party. Had I not already made a decision in this race, that mailer would have definitely done it. I have worked with Chief Piluso over the past year and half (coming on 2 years) on a Domestic Violence project. She has been a leader in bringing information and services to victims, employers and her community more generally. Am proud to be associated with her. I would vote for Carla based on her integrity alone.